Learn more about citrus bergamia, the key ingredient in all our natural superfruit supplements. Bergamot, or citrus bergamia, is a rare citrus fruit native to the Calabrian region of Southern Italy due to sensitivity to the weather and soil conditions, which accounts for 80 percent of the worldwide production of bergamot. This superfruit has been used for decades in the Calabrian regions for its beneficial effects in promoting overall health - particularly, in support of cholesterol, cardiovascular, and metabolic health*. What makes bergamot unique among citrus fruits? Citrus bergamot contains five unique antioxidant polyphenols in unusually concentrated amounts, which help protect your body’s trillions of cells from free radical damage. The juice and albedo of bergamot has a unique profile of flavanoid and glycosides, such as neoeriocitrin, neohesperidin, naringin, rutin, neodesmin, rhoifolin, and poncirin. Naringin has been shown to be beneficial in animal models of atherosclerosis, while neoeriocitrin and rutin have been found to exhibit a strong capacity to prevent LDL from oxidation. Imprtantly, bergamot juice is rich in brutieridine and melitidine with an ability to inhibit HMG-CoA reductase, which inhibits the liver's ability to produce LDL, resulting in reduced cholesterol levels in liver cells*. Not all Bergamot Products are Equal! BergaMet is the only company whose bergamot extract is approved by the prestigious Accademia del Bergamotto in Calabria, Italy. BergaMet Products are the only bergamot based products that faithfully follow the proper dosage and concentrations of Bergamot extract used and recommended in all the recent clinical studies. 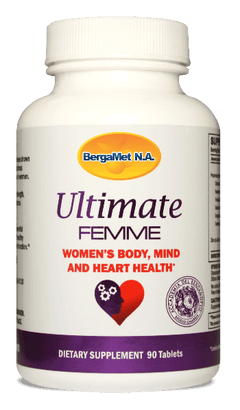 BergaMet supplements are made with a patented process that compresses polyphenol-enriched powder, containing over 40% flavonoids, into Bergamot Polyphenol Fraction (BPF) tablets. BPF contains the same flavonoids as Bergamot juice, but at much higher levels. Bergamot Polyphenolic Fraction is 200 times more concentrated in BPF tablets. The Calabrian region of Italy yields the most potent citrus bergamot fruit in the world, which enables BergaMet to produce a BPF (bergamot polyphenolic fraction) of 47 percent or greater - the most concentrated extract available anywhere. Competing citrus bergamot products contain only 38 percent BPF or less (BergaMet products contain a minimum of 40 percent and up to 47 percent BPF). Bergamot is naturally sourced, organic, and grown with no pesticides whatsoever. BergaMet is the only bergamot product formulated based on the most up-to-date research by highly regarded medical professionals who oversee thousands of patients currently taking bergamot supplements. Learn more from our medical team. Bergamot has long been considered a gift both precious and mysterious. The fruit grows exclusively along the coast of Italy, from Villa San Giovanni to Brancaleone, in an area known as Reggio Calabria. Bergamot (citrus bergamia) is spherical in shape and turns vibrant yellow when is fully ripe. The fruit, according to historians, is a cross between lime and grapefruit (though some say it’s cedar instead) with bitter orange. The first recorded traces of citrus bergamia appear around 1750, when a man named Nicola Parisi cultivated the first-known extensive planting of bergamot trees near the Calabrian region in Southern Italy. This area has a tropical humid temperate climate (meaning hot humid summers and mild winters) that happens to be perfect for growing not just any citrus bergamot, but the best in the world. Even other regions with similar climates, like Argentina, Brazil, and the Ivory Coast, can’t match the quality of our Southern Italian fruit. Citrus bergamot is widely useful as well as rare. Its cultivation in native Calabria totals around 22 thousand tons of fruit each year - incredible when compared to the 70 million tons of common citrus fruits produced globally each year (over half of which are oranges). Bergamot farmers perform a clever pruning technique that allows each tree to grow in volume while lowering its stature at the same time, providing plants protection from strong summer sun and winds. Citrus bergamot trees produce fragrant white flowers and have robust, shiny green leaves all year round. Although certain types of bergamot can be grown all around the world, our extract’s especially high concentrations of five polyphenols in particular are unique fruit grown in the Calabrian region of Southern Italy. Reduces cholesterol and supports health glucose levels by blocking cholesterol absorption in the gut in support of overall healthy levels. Our bergamot is grown with no pesticides and contains no added colors, flavors, or preservatives. BergaMet contains five unique antioxidant polyphenols and help preserve arterial health and elasticity. BergaMet works to improve and preserve arterial elasticity. Citrus Bergamot has been clinically shown to reduce inflammation. BergaMet has over 17 published clinical studies funded by the Italian government. Sign up for our newsletter to get exclusive discounts and hear from our world class medical team.